The one niche that seems to always grow in California, and bring together more and more enthusiasts, is the classic car market. Although depending on where you are in the world your definition of what makes a car classic may vary, you will certainly find most cars categorized as classics in California. Classic cars age like wine – the older they get the better they are. And like wine, each car has its own appeal. And just like wine again, they are hugely popular in the Golden state. Califorinia is not just a wine country, it is classic cars country. The great thing is that more and more people are starting to see the value of these vehicles. However, that leads us to a bit of a stand still. No one can agree on what should be called a classic. Is it determined just by the age? Does the vehicle model itself matter? Honestly, a true classic car should bring you some sense of antiquity, some uniqueness. So it is up to you to decide what exactly you call a classic – the important thing is that you still see the value. Even though there is interest in such vehicles all over the States, we cannot really cover them all. So here we will focus on one of the most prominent classic car collectors’ hubs – California. The Golden State is ripe with amazing vehicles – old and new. But it is the vintage ones that tell us about the history of the automobile industry. California has always had a special relationship with preserving pieces of history. It is no wonder that one of the best automobile museums is found there. And it is really a great place to meet fellow collectors who have a taste for the vintage vehicle – especially the American-made ones. On that note, here is a sense of pride we can have as Americans – we have contributed more to the classic car stage than any other country. We have so many brands with history – Chevrolet, Ford, Pontiac and Oldsmobile to name a few. But the great part is that you can see most of them in California. And even buy one! If you are wondering what jewels you can find in the Golden State, let’s look at a few examples. Of course, we have to start off our list with the famous Ford Model T. This car is the dream of every collector. While finding one in pristine condition is almost impossible, there are many restored units available. The 1940 Cadillac can also be seen at different places as it is among the most common vintage cars in California. It is fairly accessible, but that does not make it any less remarkable. It is a true gem and seeing it polished is a sight to behold. If you ever get the chance to take a good look at one, do not miss it! Another interesting thing to notice on California’s roads is the presence of various classic muscle cars. An older Mustang, for example, is a sight you can catch every now and then. The occasional Chevrolet can also be spotted. Which is very entertaining because most classic cars are not usually driven around town. Muscles, however, are somewhat of an exception. If you pay enough attention, you will definitely notice quite a few remarkable automobiles on the streets. Some that should not even be driven because their value is quite significant. But maybe people just do not know better. However, they can still serve as a spark to light up a new desire in you – the one for classic vehicles! Are you interested in starting a classic car collection? Perhaps expanding your current one? Or maybe you just want to take your amazing vintage car to a show? The common thing in these scenarios is that you would need to transport your classic car to the next show. Because the road is a harsh place for a classic. We are experts at shipping specialized cargo such as a classic car, and our main goal is to help people when they want to transport their vehicles. But when it comes to classic cars and vintage models, a simple car carrier may not always be enough. Of course, it all depends on your situation and what you actually want from the service. But do you know what your options are? Let’s take a look! The most common car carrier out there is your regular open transport. That is what you have definitely seen roaming the highways and the interstate roads – a big truck, carrying 6-8 vehicles on its trailer. It is the cheapest and easiest to book option, but it has one very serious limitation for car collectors – no weather and dirt protection. Transporting a vintage vehicle requires more care and dedication. Leaving it out in the open is not an option, especially if it is an open top. So at that point you have to choose another option – enclosed carrier. Enclosed auto transport trucks can again carry several vehicles, but the trailer is completely enclosed. That means that the weather cannot affect vehicles inside it and no road debris or dirt can get to them. However, enclosed carriers take longer to book, as they constitute only 10% of all US auto transport. Plus they are usually more expensive. So if you want to book one, make sure you reserve your spot some time in advance. But we are not done yet. Corsia Logistics is proud to give you another option. 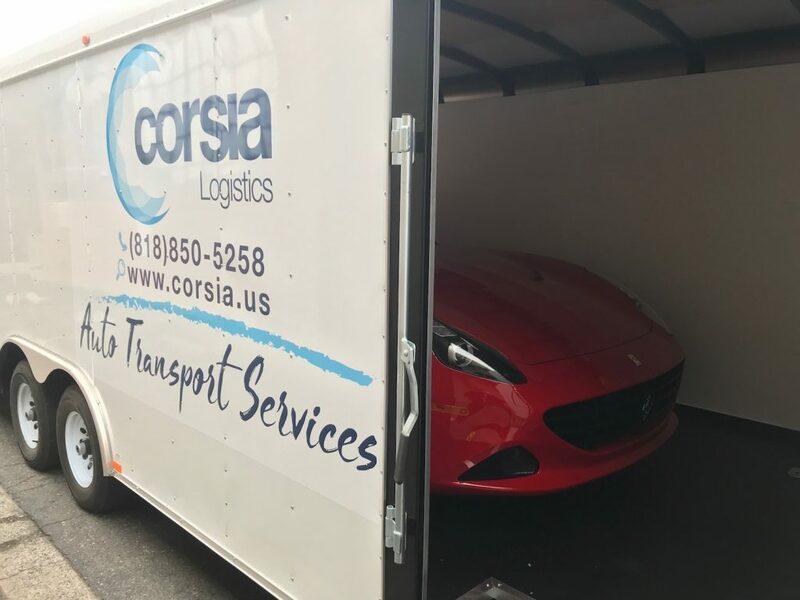 Right now we service the entire west coast with a special kind of auto transport trailer – a one-vehicle-only enclosed car carrier, which is designed specifically for classic and luxury vehicles. This is the best possible protection you can offer your automobile. As we have already mentioned, enclosed transports are superior to regular ones in their protection. Nevertheless, the multi-car ones are still a bit inconvenient for a lot of people, who want special treatment of their vehicles. With a multi-car carrier, your pick-up and drop-off dates may be a bit harder to schedule. You have to give us a timeframe when you are available and the carrier will arrive within that window. Keep in mind that the driver has to pick up other vehicles as well. So if another customer delays them along the way, that may reflect on the delivery time. With a single-car enclosed carrier, all the attention and care is reserved for your vehicle! The driver will only work with you, so pick-up and drop-off times will not be affected by other clients. This is the best option you have for transporting your classic vehicle. Do you need to transport a classic car? Whether for a show or because you have just bought one, we are the right auto transport company for your job. You can get a free, no-obligation car shipping quote online or by phone. Call us now and let’s discuss your options and your classic car transport in California. I shipped my BMX X5 from California to Georgia about a month ago. Corsia Logistics was the BEST service I could have hire to do the job. They were quick, affordable, professional and honest ! Thank you very much for the nice words and for letting us use you as reference contact! Thanks from Luke and myself!